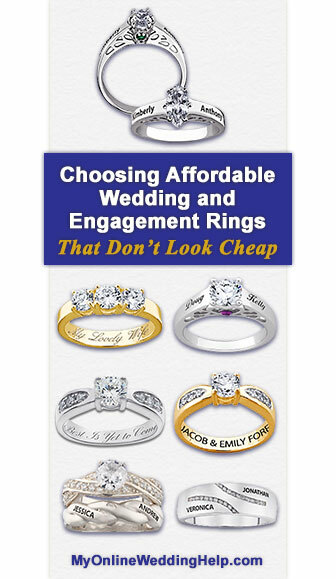 You know the dilemma: you want a diamond ring but the only ones you can afford have stones so dinky they scream “low budget.” There are other options for having a nice-looking ring your friends can legitimately swoon over. In fact, you have likely seen inexpensive engagement rings and wedding bands on others and didn’t realize it! Here are materials and features to consider. Note: The rings featured in the title image are sold by Limoges Jewelry. There is more information about them throughout this post. As with most links on MyOnlineWeddingHelp.com, product links in this post go to this site’s shop section or directly to a merchant. In either case, My Online Wedding Help receives a small commission from the merchant if you click and buy. Metal choice greatly affects cost. Traditionally, 14K gold is the most popular metal for rings. Nowadays, not so much. There are directions you can go to have an upscale look without the correspondingly high price tag. – Silver is not only popular, but it is also affordable. There is usually a large difference in price between gold and silver rings. And because white- and grey-tone metals are currently more on trend than yellow-tone varieties, you will quite likely find a number of silver rings you like. As an example of the price difference, take a look at the silver “Best Is Yet to Come” engraved ring. It is very similar to the 10K gold ring mentioned above but, at around $60, costs nearly 75% less. – Gold over silver is another option. If you like the cost of silver but the yellow color of gold this could be your solution. Check out the 3-stone 14K gold over silver ring engraved with “My Lovely Wife,” around $50. – There are other, modern materials with lower price tags as well. Tungsten, titanium, and stainless steel are all commonly used in ring making. Simulated diamonds are larger for less. I am sure you’ve noticed, based on the prices, the stones in the featured rings aren’t diamonds. They are cubic zirconia. These and other simulated diamonds are another way to keep within a small budget while still getting substantial bling. The “Jessica Andrew” name engraved bridal set contains 2.21 total carats for around $90. If you have been looking at rings at all, you know this is a tiny fraction of what you’d pay for the same size diamond. Or, get creative with accent diamonds. If simulated diamonds are not for you, consider looking at styles that incorporate diamond accents or chips in interesting ways. The “Veronica Jonathan” wedding band has .10 ctw of channel set accent diamonds and costs about $100. The way the stones curve around the names adds to the design in a way that will take everyone’s mind off the size of each diamond. Ring design can be the star attraction. Speaking of design, choosing a ring style that wows can take focus off the stone and put it on the construction. Both “Doug Kelly” and “Kimberly Anthony” have intricate details when viewed from the side, plus a surprise birthstone. These rings are around $80 each. Engravings, like the names or messages on all these rings, are another way to bring attention to what is truly important about your ring–that it represents the relationship and love between you and your spouse or fiance.